In stock. Order in the next 6 hours, 56 minutes and it will go out today! The PERFECT back of room sales item for your shows! An instant author magic book! The perfect back of room sales item - your own magic book! Great up sell for Birthday Parties!!! Imagine how much money you could make at the end of every show (or online) by selling your own fully illustrated magic book! We make that easy by giving you a professionally written, designed and illustrated PDF of the book that you can Print out and start selling straight away! What's even better is that your name will be on the front, your contact details will be on the back, and you'll be able to add pages to the book advertising your other shows. This is the ultimate way to make more money after shows whilst promoting your services for future bookings at the same time! It's a powerful marketing tool that will be loved by kids and parents alike. Includes 13 beautifully illustrated tricks! We've done all the hard work for you. You'll be getting a 30 page magic book packed with fully illustrated, easy to do tricks that you can start selling straight away. You'll also receive a professionally designed, eye-catching cover featuring your name and contact information. It's a product that you will be proud of. 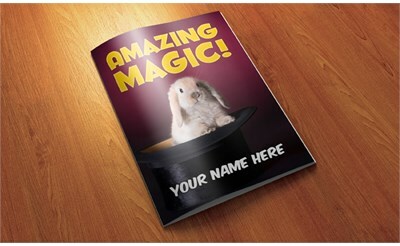 Make more money and book more shows simply by selling the AMAZING MAGIC book.